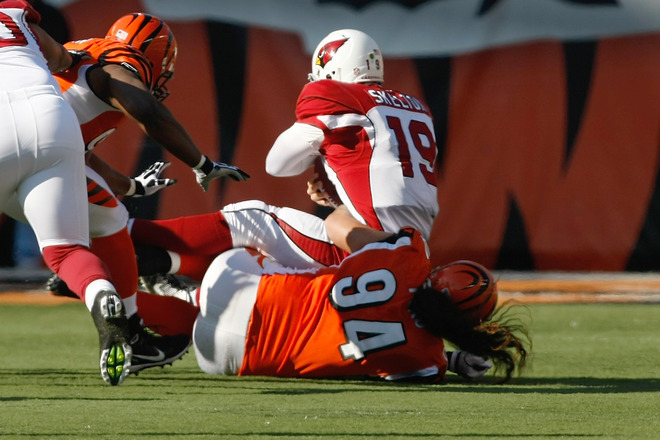 The Cards came out flat against the Bengals, which was discouraging since both teams were playing a must-win game for their playoff hopes. John Skelton got the start once again with an injured Kevin Kolb sitting out, but the second-year man out of Fordham was pestered all day long. He was sacked five times and threw three picks, putting the Cards in a 23 point hole. The game seemed decided, but when the fourth quarter rolls around, the Cards are unpredictable. They had a quick score from a 30 yard TD to Fitzgerald, putting the game at 23-7. The defense remained stout and Skelton took advantage by tossing another TD to Jeff King. Their two-point conversion attempt failed, but Cedric Benson fumbled the ball, giving the Cards another shot. Down by only a TD, Skelton threw a ball to the Endzone at a wide open Doucet, but the WR slipped and the ball was turned over. Skelton had a last gasp opportunity, but the Card's playoff hopes winded down to a sad and painful end. The season is truly a tail of two tale: the Cards started 1-6, but a mix of Skelton heroics and a stout defense brought the Cards back into the playoff hunt. The team has a lot of potential for next season, but this season is essentially over.